Per OSHA, forklift training can be completed onsite, in a group, online or in a scheduled class utilizing an appropriate forklift training package that covers required training topics. OSHA compliant forklift / material handling equipment / powered industrial truck safety training as it is also referred to, is most appropriate when provided onsite at the employer’s facility. This provides operators with the ability to see the hazards associated with their workplace as well as enables them to be trained on the equipment they will be operating (as required by code). A forklift class can be delivered in a scheduled class which is either delivered on the employer’s site or off site. OSHA compliant forklift training for new operators must include the formal class, online, group training delivered with a training package that covers the topics that OSHA mandates for proper certification. Training packages offered by Askthesafetyman.com are by far the best value to employers. They can deliver OSHA compliant forklift safety training onsite or on demand by installing the forklift training package on computers within the facility and allowing operators to complete the training as workforce scheduling permits. New equipment operators shall receive formalized training in the form of a lecture, classroom delivery or online training. This shall be followed by a demonstration of proper operation and then formalized, hands-on training concluding with a skills evaluation to verify comprehension. It is important for operators who are completing the online certification to receive equipment specific training from their employer to be in compliance with the 29 CFR 1910.178 standard. Online training is a great way to quickly and inexpensively recertify employees who are due for their three year evaluation. Is a Written Exam Enough? No. The forklift code, 29 CFR 1910.178, as written is a little vague on the exact training or evaluation certification requirements for forklift and powered industrial truck operators. Fortunately, OSHA issued a Standard Interpretation to help clarify the three year recertification requirement. Here is a link to he full text of the Standard Interpretation letter issued on August 1st, 2005 . The Standard Interpretation clarifies that employers are required to evaluate the operator's knowledge and skills in combination to ensure they are still capable of operating their powered industrial equipment safely. Employers are required by OSHA to conduct a knowledge and skill evaluation of all equipment operators every three (3) years. The 29 CFR 1910.178 forklift code does not specifically require recertification TRAINING. Employers may choose to provide full classroom and hands-on training or they may choose the classroom training with a skills observation or, they may choose to only evaluate the operator's knowledge and skills by performing a written exam and skills observation, without any retraining. Operators who do not pass either evaluation would then require retraining. The BASIC Recertification Evaluation provides employers with the ability to remain OSHA compliant by evaluating their equipment operator's knowledge and operating skills. This is NOT a training program and no instruction or reviews will be provided to operator's before the evaluations begin. OSHA's 29 CFR 1910.178 forklift & powered industrial truck code requires that operators knowledge and skills be evaluated every three years, provided the operator(s) are not subject to mandatory retraining as outlined in the same code. Cost of the BASIC Recertification Evaluation is $45 per operator. This is a pass / fail evaluation of the forklift & powered industrial truck operators knowledge and performance skills. There is a minimum of 5 operators required for the BASIC Recertification Evaluation program. If you do not meet the minimum program size a $100 additional fee will apply. OSHA requires employers that utilize counter balanced forklifts, swing reach trucks, order pickers, stand-up forklifts, walkie-riders and more to provide training and certification for all employees who are required to operate the equipment. OSHA's 29 CFR 1910.178 forklift code requires employers to provide training on each piece of equipment the employee is expected or required to operate. 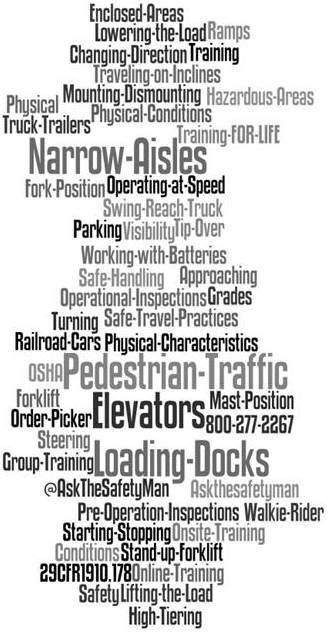 Askthesafetyman provides employers with many options related to forklift / lift truck training. Our training packages, classes and online programs are low cost, high quality and designed to keep mandatory training costs way down. Our forklift training package for employers provides everything necessary for a company to develop and deliver their own in-house forklift / powered industrial truck training program. Why pay upwards of $180 or more to train each employee or purchase other training programs costing upwards of $399? Deliver quality, in-house training at a fraction of the cost that national equipment training companies charge.